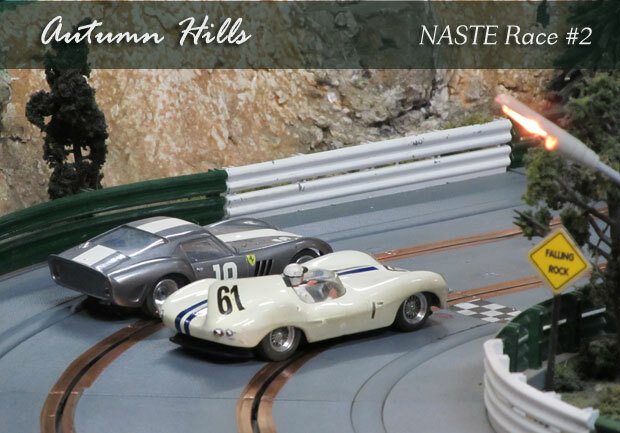 Autumn Hills hosted the final race of the 2014 NASTE Point Series Championship. Thirteen racers showed up to make their final run at the championship. Autumn Hills has always been well known for its famous dinners, and Kelly Locati laid out another fantastic meal for us. Thank you so much Kelly! Rico Locati's expertise is car set up and preparation. Rico did not disappoint us either with Scalextric cars that had been tuned and prepped for the IROC format. The cars performed well and provided some very close racing. Rico Locati took the race win, but Terry Abbott was the star of the night. 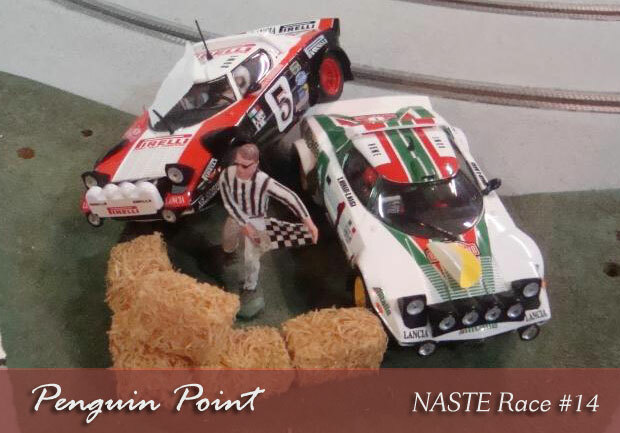 Terry drove an excellent race finishing 4th and securing his title of 2014 NASTE Point Series Champion. In the NASTE Challenge Division Thomas Flood was first at Autumn Hills. Like her hubby, Dorothy Abbott was not to be denied her championship status. Dorothy was a contender at every race this season, and not just in the Challenge series. Dorothy is the first NASTE Challenge Champion, a title well earned! 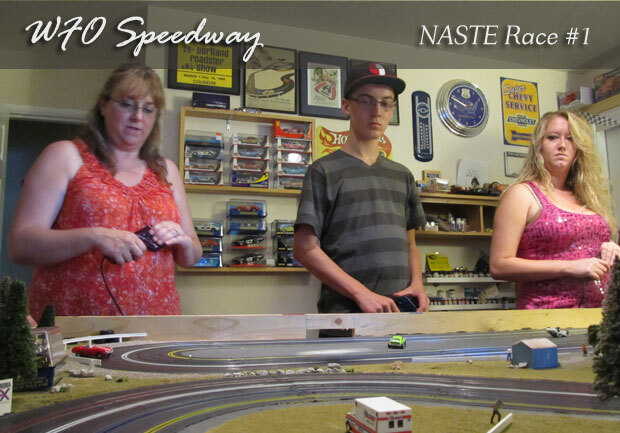 On May 17th 2014 NASTE racers had the opportunity to race at a commercial slot car raceway in Salem Oregon. Commercial raceways are not locally available. There have been very few that have been opened around here in the last 30 years. 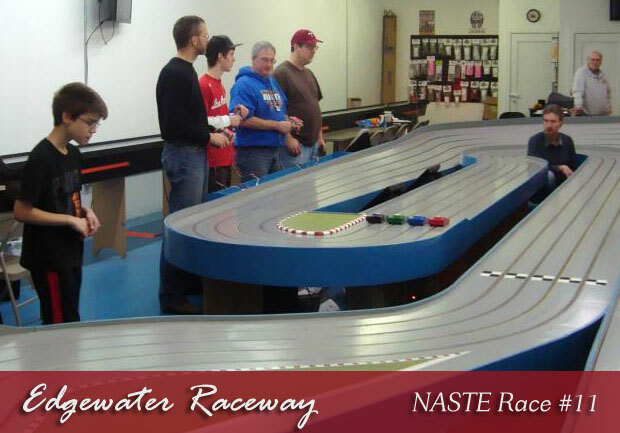 For many of the NASTE racers this was a chance to experience what they had missed in slot car racing's prime. For others of us it was a flashback filled with great memories. Edgewater Raceway in Salem Oregon sits on a historic street in an older part of town. There are large windows in the front of the building, giving a passerby on the sidewalk an excellent view of the tracks inside. On this race day, on numerous occasions throughout the race, spectators would gather at the windows and watch. On one occasion two young boys ventured inside the building and took up positions trackside to get a better look. As I watched the boys and listened to their comments I remembered myself, or more accurately a much younger me, watching the first commercial slot car race I had ever seen. The first race I ever saw was at a slot car raceway in Parkrose Oregon. It was a large shop with multiple eight lane tracks. I remember there were as many or more spectators than there were racers. The building was packed and filled with excitement! But this race was different. 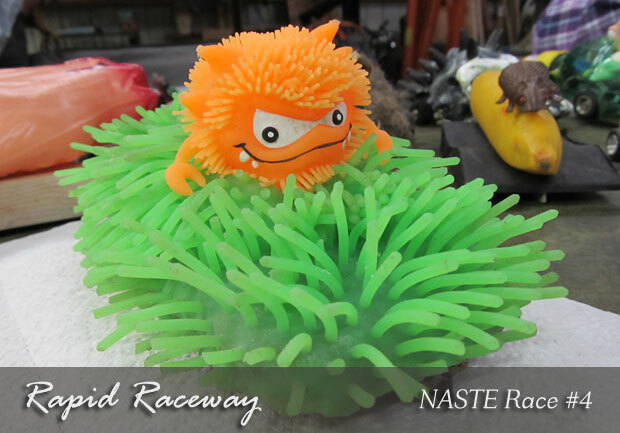 This was a NASTE event, and NASTE racers create their own style of atmosphere. With the track owner's permission, we started off with a terrific pot luck style meal at the raceway. Between bites racers took a few practice laps on the big beautiful four lane track. After dinner Dave Smith held a short driver's meeting, and then lined the cars up on the start line. This was the third time we had raced the Parma FCR based cars at Edgewater Raceway. These Dave Smith prepared cars have proven to be very durable, and fun to race in the IROC format. The racing was very close and competitive. We raced two rounds so everyone got plenty of race time. At the end of it all Monte Saager emerged as the overall winner. Monte drove a fast smooth (pun intended) race to capture the victory. Dorothy Abbott showed her skills by winning the NASTE Challenge amateur division. NASTE thanks Art and Dave for yet another great race at Edgewater Raceway. And I thank them for letting my 'inner little boy' out for a while! The Plan - For the sixteenth race of the 2014 NASTE season, the NASTE '55 Chevy's were scheduled as one of the IROC car classes. At their last Rapid Raceway appearance the '55s exhibited outstanding performance due in part to the incredible traction or grip they seemed to have on the track surface. With that in mind, a plan was formulated to prep the track for this race in the same manner as the last race. So, Rapid Raceway underwent a thorough cleaning to remove any and all traction compounds or stick-?em (a technical racing term) from the track surface. 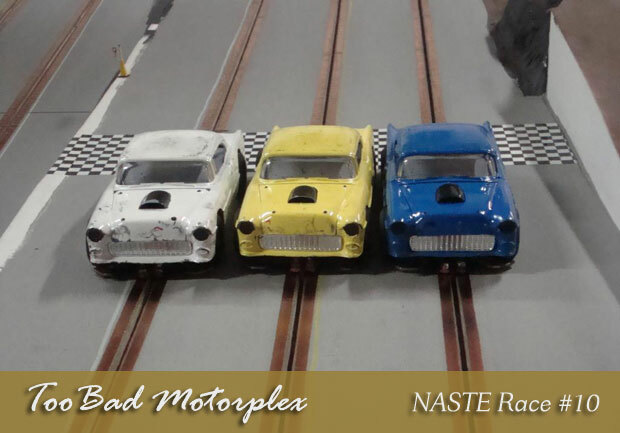 In theory this would give Rapid Raceway the same race setup as the previous race where the '55s exhibited such outstanding performance (based on typical NASTE '55 Chevy performance standards - the bar being set somewhat low to start with). In addition to the NASTE '55 Chevys, a full complement of 1/24 BRM Porsche 962s were added to the racing schedule. This was going to be one spectacular night of IROC racing! The Execution - So everything was set. The race format was set for two rounds of racing. The first round of two minute heats with the '55 Chevys, and the second round with the BRM Porsche 962s. The track was clean as a whistle and ready for racing. A timed rotation system was used for a practice session before the actual racing began. The '55 Chevys were up first. There did not seem to be a lot of available grip, but from the last race experience it was felt that it would improve, confidence was high. After the '55 Chevy practice session the BRMs hit the track. Again, not great traction, but not too bad overall. A pot luck dinner was held through the practice session. There was LOTS of great tasting food and deserts! After everyone was done eating the '55 Chevys were put on the start line. When the green flag dropped, so did the traction. There was none! The '55 Chevys were back to their old form of slipping and sliding their way around the track. Lap times were a full two seconds down from the previous race at rapid Raceway! I will say this makes for some very challenging and close racing! It appeared Terry Abbott and Dave Smith seemed to be doing the best job of getting the cars around the track with the best lap times. After all the racers had battled with the '55 Chevys the BRM Porsche 962s were put on the starting grid. The general feeling was 'phew, man am I glad that's over, these cars should be a piece of cake'! Well, not so! The traction had not only gone away for the '55s, but the BRM Porsches would hook up no better. So now we had cars with about three times the power, but absolutely no more traction! The racing was absolutely crazy! Only those with the best throttle finger control were able to put together decent lap times. Even with the less than optimal traction situation the racing at Rapid Raceway was a huge success. As I surveyed the crowd of twenty racers it was obvious everyone was having a great time! The car's performance remained pretty equal throughout the racing, with no one racing a car that performed better or worse than the previous racer. Everybody dealt with and raced with the same set of issues. And just to repeat for the sake of clarity, the racing was CHALLENGING and CLOSELY CONTESTED! A BIG thank you to Howie for hosting this race at Rapid Raceway, and to all the racers that participated in the pot luck meal! 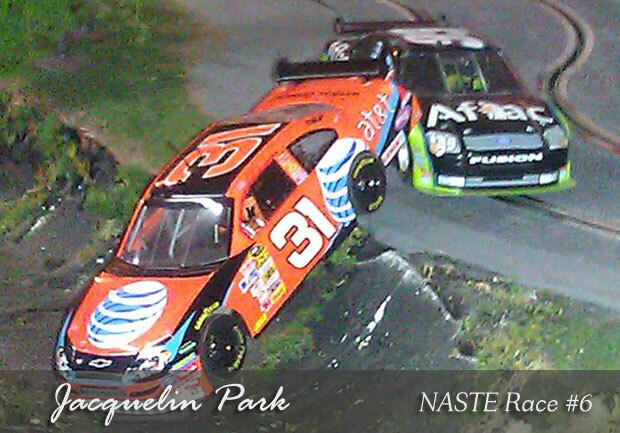 Jacquelin Park was the setting for the 15th NASTE race of the 2014 season and the third Enduro. And this time Monte had all the equipment set up and running perfectly from power control to break-out timing, all systems were go. To add to the veritable excitement the cars of the night were SCX Digital NASCARs with magnets. The idea is that cars with magnets would make driving easier for all levels of competitor, the added upside was that I think we only had to 'fix" one guide bade that popped loose rather than one every five minutes. Competition becomes so fierce that halfway through the final heat both the Hammer and Clubber teams were in a tie. But finally after two frantic hours of competition TEAM HAMMER pulled out the win with TEAM CLUBBER holding second with June and the Three Amigos taking the final spot on the podium. Thanks to all for coming out, and thanks to Dorothy for an exquisite selection of desert options. I think I tried them all. Penguin Point welcomed fourteen racers for the fourteenth race in the season series. This time Monte has set up two different classes of cars. For the first set, Cartrix Classic F1 racers. The second would be Ninco Stratos rally cars. This was our first race with a set of Cartrix cars and there is a lot to like. They seemed to run well and look fantastic. The site of three open wheelers diving into the first turn looks amazing. Taking the checkered flag in the NASTE Challenge division was Dorothy Abbott with a near one lap lead over Perry Petrequin with Mike Lombardi another half lap back in third. Dorothy's victory promoted her to the Master Class for the second Cartrix set. In the second set it was home town here Monte Saager taking the honors with Terry Abbot in second and Tracy Flood in third. For the second race out came the Ninco Stratos. A little tougher to handle, lap times dropped. And as you can see above, flagmen were endangered. Pulling out the win in the NASTE Challenge class was Dennis Hart with a 4/10 lap victory over Mike Lombardi and Mitch Brooks both tied for second. Dennis advanced to the Master Class. And in the final round it was the local bully Monte Saager out front but not by much. Half a lap back in second was Tracy Flood with Bill Bostic nipping at his heels another tenth back. A big NASTE salute to Victoria who managed pizza like a boss as well as Dorothy "the Queen of Chocolates" and all the rest that helped fill out the menu. 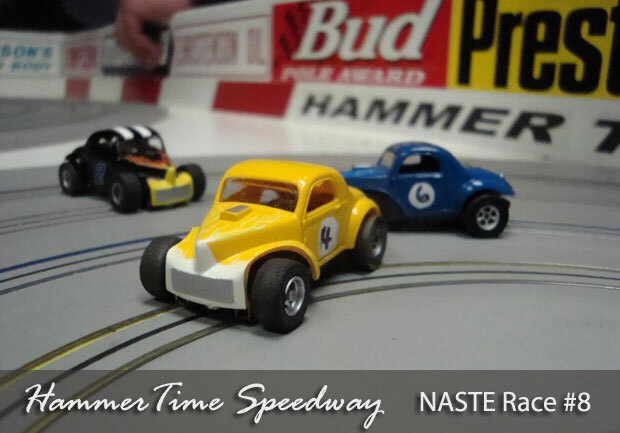 NASTE racing at Terry & Dorothy Abbott's Hammer Time Raceway; you just NEVER know what is going to be on the track for your racing enjoyment! Wait, I take that back; there's a pretty good chance they will be SMALL! HO racing just doesn't get any better than racing at Hammer Time, and Terry did not disappoint us. 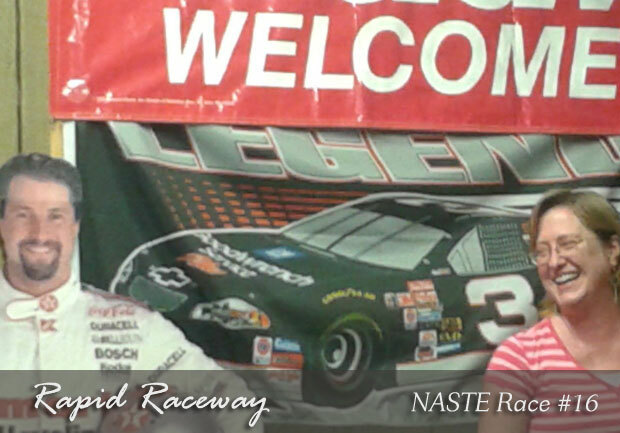 Terry took us back to our childhood HO racing days with some way cool, totally creative and imaginative race cars. Back in the old days none of us could keep some kind of knife away from our T-Jet cars. Add to that glue, putty, and thick coats of paint and we instantly had creations Big Daddy Ed Roth would have been proud to claim! On Saturday March 15th Terry Abbott allowed us to race those dream machines we created. For the first round of racing the field was set with some beautiful old style modified racers. Terry expertly assembled these Aurora Thunderjet 500 cars using A/FX style wide wheels and tires, and T-Jet style Johnny Lightning Willys bodies with the fenders cut. These cars looked great, and they handled even better! Dave Smith showed us the fast way around the track, taking the win by a slim margin over Terry in second place. Then it was time. The beautifully crafted, magnificent Space Machines were on the start line! I instantly reverted back to my 8 year old self as I anxiously gripped the Parma Turbo controller (something I never even dreamed of when I was 8 years old!). When the flag dropped I was transported to the future I remembered as a child! These cars were SO cool!!! Mine never looked or ran so good!! I was the fastest 8 year old in the garage tonight! Then reality set in, beaten again. But hey, not by much! Terry Abbott was the fast guy around the track with the Space Machines. A well-deserved win! I can't begin to describe to you what a great time I had at Hammer Time Raceway. From comments and watching the crowd I?d say there were 19 other racers there that would agree with me 100%. The food and snacks Dorothy Abbott put out for us were amazing! Attending a race at Hammer Time is as much about Dorothy's delicious food and snacks as it about racing. Thank you Dorothy and Terry for a fantastic evening of racing..and eating! Welcome to the Lightning Round! A dozen racers took part in the twelfth race of the 20214 NASTE season held at Penguin Point this past Sunday. For the first set Monte set out three LMP cars - two SCX Audi's and a ScaleAuto Toyota. Traction was a little on the down side and the powerful motors made it a little tough on the drivers. Taking the top spot in the NASTE Challenge race was Dorothy Abbott with a total of 35.4 laps. Tied for second was Victoria Saager and Tyler Petrequin with 34.8 laps. With her victory Dorothy was moved into the Advanced race with the big dogs. In the advanced race home town hero Monte took first with 40.3 laps. Rico Locati and Tracy Flood tied for second with 39.0 laps with Terry Abbott just another three tenths back. The next race was a different format - the Lightning Round. One-minute heats divided into 30 second 'Crash and Burn' segments. Come off and you are out for the duration of the 30-second segment. Scoring would occur after each segment via laps plus points. As it turned out a 6 was a high segment score. On the plus side, no one complained about the corner marshals. It was different. Taking the top spot in the NASTE Challenge portion was once again Dorothy followed closely by June Petrequin. Both were promoted to the final. And in that final Rico Locati took the honors with 31 points followed by Terry Abbot with 28 and the surprising Dorothy with 27. 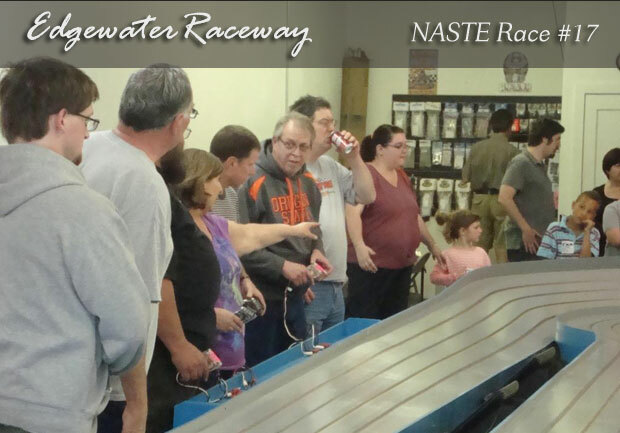 Thank you to all for showing up for a fun and interesting afternoon of slot car racing. A special thanks to Dorothy for bringing a fine collection of chocolate offerings. Yes, it was all about the Floods in Salem. But let me backtrack a little. Eight brave NASTE racers, without thought of personal safety, set out on an adventure of a life time. A trek if you will, to the far out reaches of Salem Oregon, in some of the most horrible, frightening, arctic conditions imaginable! Yes even just the thought of it brings my brain to numbness! To celebrate our safe arrival in Salem, seven of us feasted at McDonald?s. After filling our stomachs with that exceptionally healthy food, we headed over to the track where Dave Smith was finishing up with the race preparations. Dave had serviced the Parma FCR cars which we had raced in the last NASTE event at Edgewater Raceway. The cars were ready to go! The track was open for practice from 4:00pm to 5:30pm, so everyone on hand had an opportunity to get used to the track, and prepare for battle. Dorothy Abbott brought along plenty of her excellent treats to keep us amped up throughout the evening! At the drop of the flag, the race was on. These Parma FCR 16D powered cars are so evenly matched the competition is incredibly close! Throughout the race there were many side by side battles for multiple laps. We raced two rounds, consisting of 30 lap heats (approximately 3 minutes on each lane). At the end of the first round in the NASTE Challenge, Thomas had a four lap lead over Dorothy in second. For the lead overall, Bill was just one lap ahead of Tracy. Round two is where it all shook out. Thomas extended his lead by two more laps, and Tracy tied Dave for first putting Bill back in third by three laps. So in the end it was a total Flood in Salem! Thomas Flood finished first in the NASTE Challenge, and Tracy Flood finished first overall. Congratulations to both Floods on their wins! Thank you to Dave Smith for the car and race preparation and organization! And a big thank you to Art, the owner of Edgewater Raceway! 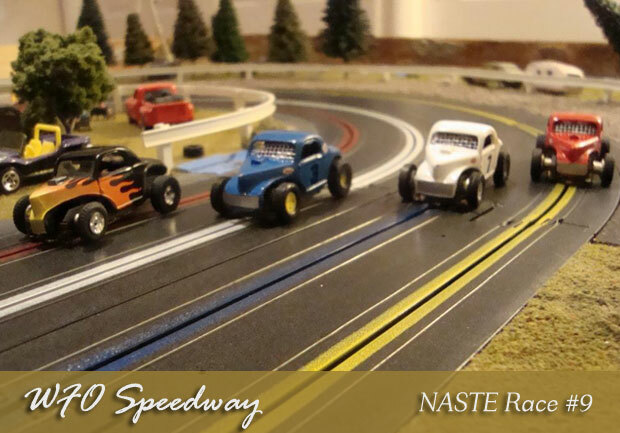 The NASTE '55 Chevys were the IROC cars of choice for the 10th race in the 2014 NASTE series. Seventeen racers bashed and slammed their way around TooBad Motorplex through two slamming-good rounds of racing. The Chevy's are somewhat slow and a rather ill-handling but what they lack in speed they more than make up for with non-stop fun. The results prove that and then some providing the closest, most exciting racing seen on the NASTE calendar in about forever. Beating the behemoths around the track and staying out of trouble best - a key ingredient - was Rico Locati just squeaking past Flyin' Bryan Trachsel by a tenth. Home-town hero Bill Bostic took third knocking Monte Saager right off the podium and firmly into fourth with a well-timed thump. And such was the racing for most of the evening. In the NASTE Challenge amateur ranks, there was a tie for the top position between Russell and Thomas Flood. The tie resulted in a trophy dash with the NASTE Challenge Trophy awarded to Thomas Flood. It was a great night with lots of food, fun and laughter. Thanks to our hosts Bill and Diane Bostic. A small group of drivers braved the blustery weather to do battle at Bryan and Sherry's in the 9th race of the season. With only four so-called "pros" in attendance, the Challenge field was packed for the first race. Bryan brought back the AC Cobras, this time with little drivers in them. Unfortunately they had no safety equipment and there were some quick decapitations. Cars were tumbling and heads were rolling. Jeff came out on top, earning the chance to wreck with the pros. And wreck they did! The first corner in nearly every heat saw carnage and had drivers fuming and marshals scrambling. Flyin' Bryan showed everyone the fast way around the track to notch the win. Tracy gave him a good run but was just a little short in second and Terry rounded out the podium. In the second round, Bryan brought out some vintage dirt track cars. More carnage, more wrecks, and even busier corner marshals. Tires were flying and temps were rising. Taking top honors in the Challenger race was Thomas, but that just meant he had to go play with the big boys. Just like the earlier race, the "pros" were just as wild on the track as the amateurs. Bryan again put the hurt on everyone to claim 1st Place. Terry and Tracy swapped places on the podium claiming second and third. It was a fun night with lots of great food, lots of laughter and a whole lot of wreckin' and racin'. 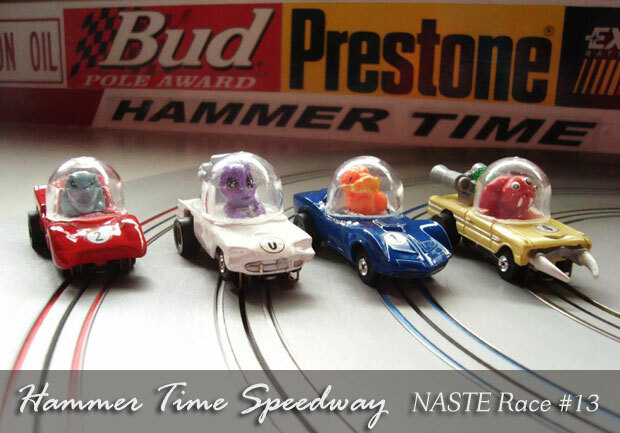 The Hammer Time Speedway was host to the 8th round of the 2014 NASTE season with twenty racers coming to play. Our master of ceremonies Terry Abbott had set up two sets of HO cars for our racing pleasure, giant Detroit steel and old-school dirt track racers. The first round introduced us to good ol? Detroit Steel and piloting the little cars around the track proved as tough as it was fun. In the first set of heats Russell Flood had the hot hand moving him into the main event just ahead of brother Thomas and Dorothy. And in the main event of the first set it was Flyin? Bryan Trachsel winning followed closely by home track favorite Terry with another HO stalwart, Dave Smith, taking a solid third. For the second set Terry brought out some fantastic looking dirt-track racers. A little slower but a ton of fun. Taking top honors in the first set and earning a trip to the mains was everyone?s favorite Hammer, Dorothy Abbott, with Tyler taking the second slot and Thomas third. In the main it was Dave Smith pushing his way through the crowd for first with Terry taking second and Flyin? Bryan all the way back in third. In between we ate. And ate. And ate some more. The food was terrific! 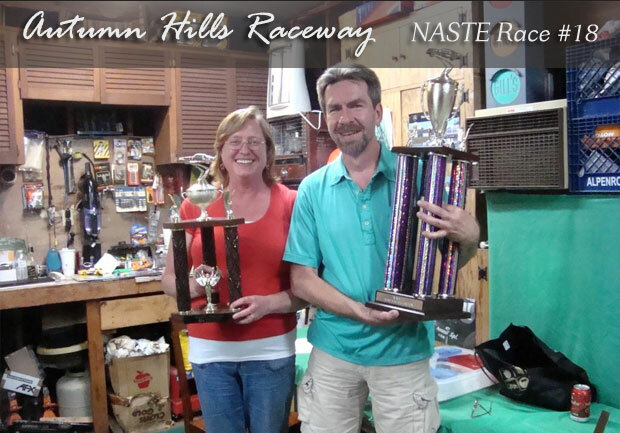 A big NASTE thanks to Dorothy and Terry for sponsoring another evening of little car racing. 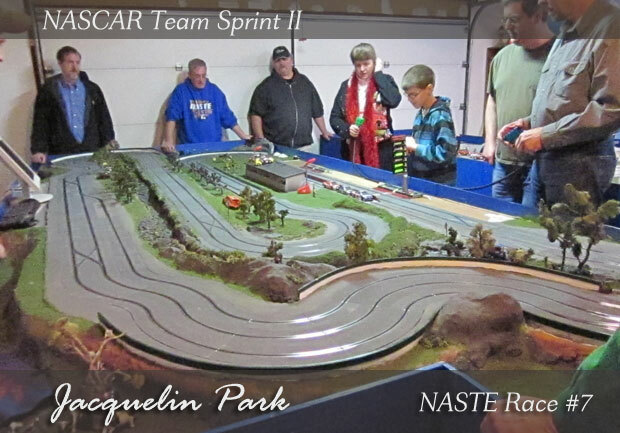 The Jacquelin Park Speedway was host to the 7th round of the 2014 NASTE, and once again it was a Team Sprint (mini-Enduro of 2 hours) with three teams driving each one of three SCX NASCARs IROC-style for 40 minutes. Drivers would rotate at each fuel change. And unlike the previous Team Sprint this one would not be subject to the 7-second speed barrier. No, it was pedal to the metal, damn the torpedoes and let it all hang out. The thirteen drivers in attendance were arranged into three teams, rules were discussed, and Monte demonstrated that driving into the pits does count your lap. Once the racing started, the action got fierce. At the 50-lap mark, all teams were on the same lap! Slowly Thunder Hammer moved out to a lead only to be overtaken by Crash 'n Bjorn. Eventually The Hairy Men moved into the lead. By the end of the first 40 minutes, The Hairy Men had an 11 lap lead over Thunder Hammer, with Crash 'n Bjorn another 10 laps back. In the second set The Hairy Men really dropped the hammer (no pun intended) on the rest of the field, adding another fifteen laps to their lead. Early in the third set The Hairy Men pushed their lead to 33 laps when disaster struck. During Monte's first driving stint, the car started to slow, so he adjusted the braids. Then it just stopped - no amount of fiddling would get it going again. Monte dragged the car back to the pits and spent over half of that lead trying to get it running. At that point the car was retired and the spare car was brought into service. The Hairy Men were able to limp to the finish, holding off the hard-charging Thunder Hammer, to bring home the victory. A big NASTE thanks to Monte and Victoria for sponsoring another evening of total chaos. And a special thanks to Dorothy for bringing the chocolate treats we all look forward to. 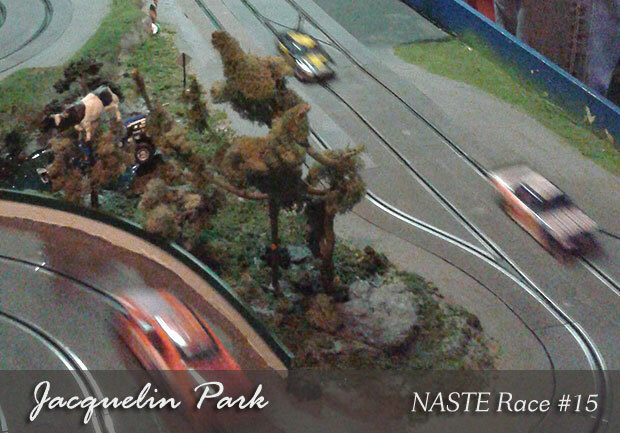 The idea was sound - the Jacquelin Park Speedway would host the 6th NASTE event of the season, a mini-Enduro of 1.5 hours with three teams driving each one of three SCX NASCARs IROC-style for 30 minutes. Drivers would rotate at each fuel change. It would be another opportunity to test the new RamJet-X controllers for SCX Digital. What the lucky fourteen drivers in attendance didn't count on was the interesting breakout format that would be deployed. Yes, as it turned out, a 7-second minimum lap time had been installed and as the team of The 5 Storms started sending their car around the track at record pace during the first session none of those laps were being counted! In retrospect, a couple of days post event there was an additional software setting discovered for minimum lap time that the Big Smooth totally missed. Rest assured it has been corrected. Unfortunately for The 5 Storms, the two hundred or so laps they probably lost couldn't be reinstated. Say it with me boys and girls: "TOO BAD!" It was however a huge bonus for the other two teams who eagerly accepted a continuing series of 7+ second laps on their way to a close fought battle at the top yet never failed to yell out "It's not counting" whenever they dipped under the 7-second mark. Clearly not all drivers learn at the same speed? Back at the track cars were flying around, drivers were jostling for position and working their way through the pit lane to refuel and manage driver changes. Finally after 90 minutes the action concluded with the Lightning team on top of Thunder Hammer by two laps, while the erstwhile fast team of The 5 Storms finished 26 laps back of the leaders. Once again, it never pays to speed. As for the controllers, they worked just fine. A big NASTE thanks to Monte and Victoria for sponsoring another afternoon of total chaos. Just wait until next time! Edgewater Raceway is a four lane routed commercial 1/24 track, built by Paul Painter. It features long straights, a steeply banked 180 degree turn, and some deceptively tricky ess curves. Dave Smith had prepared four identical Parma FCR cars for the IROC style race, and Parma Turbo controllers were in place for an "old school' feel. But, the first order of business was dinner. The NASTE racers met at Garibaldi Mex, the restaurant located next door for some excellent Mexican food. After we all had full tummies we gave racing some thought and went back next door to the track. Challenge and moved up to race in the expert division. The race format was the same as used for the NASTE Challenge race. It seemed to take the racers in the expert division a few laps to get used to the old school Parma Turbo controllers. Once the racers had a few laps under their belts the lap times started dropping, with the fast guys in the low 7 second bracket. By the end of the first round everyone was settled in and going very fast! When it was all said and done Dave Smith came out the winner. Thank you to Art, the owner of Edgewater Raceway for sponsoring this race, we really appreciate it! And thanks to Dave Smith for hosting the race and providing us with excellent cars to race! Happy Halloween - Slot Cars Dressed To Kill! 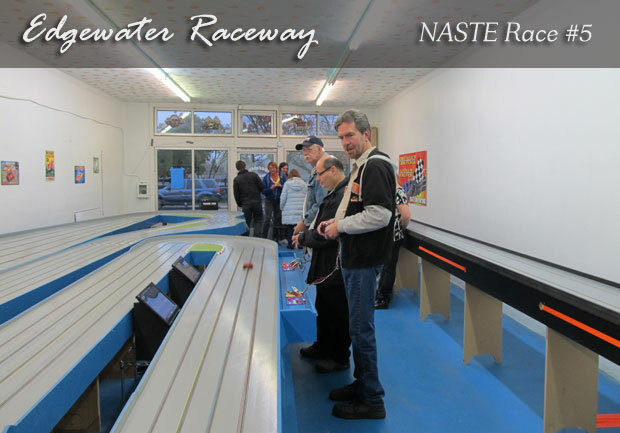 Rapid Raceway in northeast Portland was the host track for the Annual NASTE Halloween race for 2013. 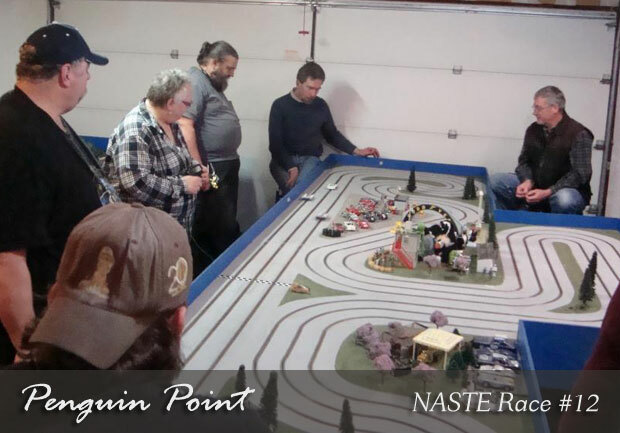 This was the second consecutive year the race was run on the 1/24 Rapid Raceway track and this year's race broke recent attendance records with twenty racers in attendance. Entries for the NASTE Halloween races are always unique, and this year there were some outstanding examples! Also included were some previous vehicles that had not seen track use in years (brought back to life shall we say)! The racing was hectic, loud, and well, unique.....normal for a NASTE Halloween race! Vehicles raced, crashed, broke, fell apart, and yes, some went fast! Bryan Trachsel earned the title of NASTE Halloween Chef with his hot dog cooker. Thanks Bryan. Terry Abbott earned the title of NASTE Halloween Crew Chief for getting multiple loaner vehicles (notice I don't refer to them as cars) on and circulating the track, as well as keeping them circulating the track (he was a VERY busy guy). Dorothy Abbott earned the title of NASTE Halloween Queen of the Sweets and Victoria Saager shall be referred to as The NASTE Halloween Mistress of Words. Todd Flood earned the respect of all the racers as the NASTE Halloween Corner Marshal Extraordinaire while also teaming with Cailin Dunbar to co-anchor the NASTE Halloween Race Anchor positions. And finally Gary "Howie" Howard for the second year in a row proved he is truly The NASTE Halloween Track Master. A big NASTE thanks to Howie for hosting the race. And thanks to all those that helped make this year?s race one of the best I can remember. The Fords of Fairview - Anything But Too Bad! 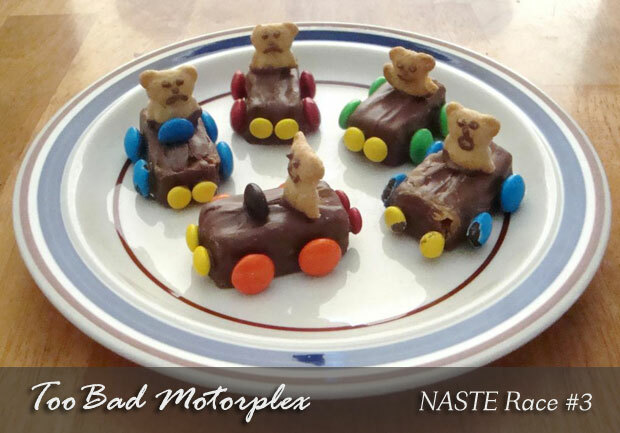 TooBad Motorplex in Fairview hosted the third race of the 2014 NASTE season. Race date was October 12th, 2013. The day started out warm and just kept getting hotter once the racing started. Twenty-two racers turned out to compete on Bill Bostic's exciting three lane routed track. Bill had selected three brand new Scalextric GT40's for the evenings racing pleasure. The cars were so new they were actually stock, with only a light sanding of the rear tires. Up first was the NASTE Challenge race for amateurs. With fourteen contestants vying for the top spot, it was Dorothy Abbott and Tyler Perry tied for the win! Russell Flood was just out of the money by a mere 3/10 of a lap. Both Dorothy and Tyler were moved up to race in the next round - the expert division. And once again the racing was very close. Pushing the little cars to the limit and sometimes just beyond Flyin' Bryan Trachsel took top honors followed closely by Monte "Big Smooth" Saager in second with Bill Bostic just 1/10 behind in third. A big NASTE thanks to all that turned out to race and especially to Bill and Diane for opening their home to us. The pizza and refreshments were to notch. And the return of Dorothy's chocolate treats were scrumptious. Fickle Fiats of Fate- check. The evening started off with a few surprises in the form of old friends, three to be exact. It was great to see Frank, Randy and Tim back at a slot car race. They certainly are welcome anytime we race. After getting reacquainted and some track time it was announced it was time for dinner and what a feast it was. The theme was Oktoberfest and it lived up to the billing with two kinds of sausage, German coleslaw, potato salad, sauerkraut, pretzels and strudel. The only thing missing was Oompa music and leder hosen. Thank you Kelly! After everyone was done getting their fill it was time to go racing and the Fickle Fiats were brought out from their hiding spot much to everyone's delight. Or was that dread? First up was the NASTE Amateur Group. Once again the Fiats proved to be tricky runners and somewhat unpredictable. Russell Flood lead the way with 24.3 laps followed by his brother Russell with 23.4 and Victoria Saager with 22.6. Next up was the Pro group (ha!) and in the early going the Fiats were proving to be more fickle than usual. A slightly loose power supply wire proved to be the culprit but the later runners definitely had the better go of it. Leading the pack was AJ Locati with 25.2 laps with Randy Stumman in second place with 24.5 laps and a tie for third between Monte Saager and Terry Abbott with 24.3 each. 'the Speedster' leading the way with 30.4 laps. Second belonged to Monte Saager with 29.4 followed closely by Rico Locati with 29.2 laps. The NASTE 2014 Season opener was one of the most closely contested races to date. We had thirteen racers on hand at Bryan Trachsel's WFO Speedway, seven experts and six amateurs. WFO is a four lane Tomy HO track that is tight and tricky but fast. The Full Monte format was used as Bryan had prepared four Aurora Thunderjet 500 AC Cobras for the first race, and four Aurora Thunderjets with muscle car bodies for the second race. The amateurs took to the track first with Jeff Wilson taking the amateur win with 106.8 laps. Russell Flood was the second amateur with 106.1 laps. Jeff moved up to race again with the experts. At the end of the first race Bill Bostic had scored the win. Second place through fifth were all on the same lap. The muscle cars for the second race were faster but much harder to control. On the track first again were the amateurs. All the amateurs improved their lap totals over their first race. Russell Flood was the first amateur this time around, with his brother Thomas following three laps behind. Russell moved up to race again with Jeff (the first amateur in the first race) and the expert field. By the end of the second race Bryan Trachsel had stretched out to a one lap lead over second place Tracy Flood to take the win. Again the racing was very close as only 1.2 laps separated second from seventh! Thanks to Bryan Trachsel and Sherry Wilson for hosting the first race of the 2014 season. They had provided lots of food, hot dogs, pizza, chips, cookies, and drinks for all. Thanks to Jill Armstrong for bringing out cookies and treats. It was a fun and closely contested racing evening!